And there you go. That’s your setup. Of course, things do not go well when he gets his wish. The scene awaiting him at his house is incredibly creepy. A perfect start to your Halloween month. 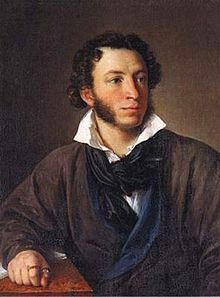 And that’s quite a trick on Pushkin’s part. With these words the corpse stretched out his bony arms toward him; but Adrian, collecting all his strength, shrieked and pushed him away. Pyotr Petrovich staggered, fell and crumbled to pieces.